They stand up on their own! "White Zip Pouch with Window"
COMMENTS: Love the look of my products in this white Pouch. With the Gold around the window it looks very elegant. Have had a lot of compliments on the packaging. I put Bath powders, shower steamers, bath salts in these. Even though they are not heat sealed I put a small round white label folded over on the top to ensure they can not be opened. • Would like to have it heat sealed. "Perfect for my sugar scrub!" 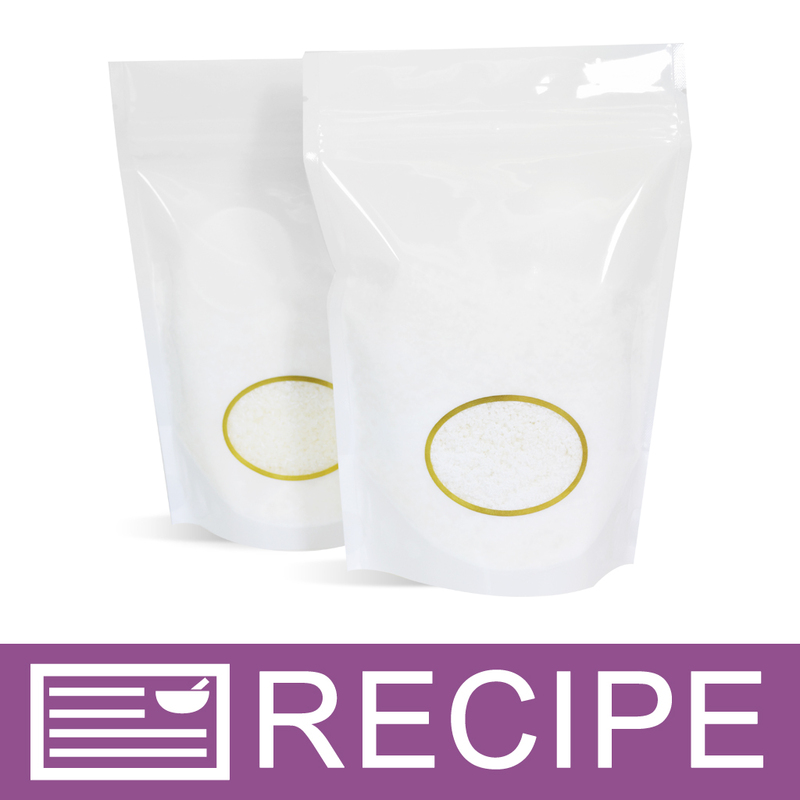 COMMENTS: I use these bags to package my sugar scrubs and they work so well! I haven't had trouble with leaking and the pretty window lets you see the product inside. Super easy to seal as well. COMMENTS: I love this! Perfect size, window to see the product, heat sealed for protection. Couldn't ask for anything more! I use these for bath salts but I could see using them for packaging smaller bath bombs as well! COMMENTS: These work perfect for bath salts, and look very professional. COMMENTS: Love these for my home made laundry soap. COMMENTS: The pouch is just what I needed and works smashingly. COMMENTS: I LOVE these little bags..They are perfect for my bath salts & milk powders. I make an amazing bath milk using finely ground cocoa butter, coconut milk,& powdered yogurt. Sometimes, when requested, I add other additives like salts or lavender buds. It makes your skin feel amazing and when it is packaged in this bag it really makes a beautiful product!! The little window in the front allows you to see just enough of the product. And all you need to seal it up is a regular old iron. SO easy & looks very professional when finished. COMMENTS: Perfect size for so many things! Great quality and easy to use! COMMENTS: I uses these for Bath Salts and Teas. COMMENTS: These are the perfect size for bath salts. They stand up on their own nicely and it is nice to have the little window where you can see the bath salts. COMMENTS: I am excited to use these pouches for my laundry soap. Already found other ideas for them. Possibilities are endless. "Great bags for salts and scrubs"
COMMENTS: These bags are really nice, thick, easy to fill. Great for bath salts! Gives a professional look to products. COMMENTS: These work great for bath salts and bath melts. COMMENTS: Pouches stand on their on for easy filling and for display. "Great product for refills of bath salts"
COMMENTS: These work great for clients that want refills for their bath salts. The window allows them to see how pretty the salts are and the closure is secure. COMMENTS: These bags are just what I needed. The bath salts were about 8 ounces a bag. I also made a milk bath with only 4 ounces, but since the window is at the bottom it doesn't look only half full. Will be buying more, perhaps a larger bag. COMMENTS: The black was out of stock when I went to order them so I tried the white. They look really professional and keep your packaging and shipping add on costs down. I use these as refill packs for my bath salts for when I sell bath salts in a glass container although I'm also selling them as a stand alone item. COMMENTS: I love these! They look so nice and professional. I use them for bath salts and they look great! Love the little window so you can see the finished product. "Classy packaging for bath salts"
COMMENTS: I bought 5 of these. They are really nice professional bags for bath salts. Love it! "I love, love, love these bags"
COMMENTS: This bag is simple and elegant and gives my products a very professional look. "Perfect Size Bag For Foot Soak Salts"
COMMENTS: I have used this pouch for foot soak and it has performed as expected. It was the right size for 8 oz of soak but I could have easily added another 4 oz without over expanding the bag. With the heat sealer it made my product look professional and beautiful. "Perfect for my toilet bombs"
COMMENTS: I use these cute little bags for my toilet bombs & soap bars. COMMENTS: These are a great size for bath salts! Love that you can see the product inside. COMMENTS: I love these pouches! People loved to be able to see the product. I used them for Bath Teas, and facial masks. COMMENTS: I used this for my bath soaks. Worked great. Nice size, like the window. Love that you don't have to seal it with heat. And the cheapest price I found! COMMENTS: I use these for facial mask, bath salts, & homemade laundry soap. These are great! COMMENTS: I just ordered over 200 of these! I love the professional look they give my product and how easy they are to fill with my product and they are of good quality. I package bath salts and foot soaks in these. Will continue to order. "Should have bought them sooner!" COMMENTS: These are becoming the perfect solution for packaging bath mixes, mask kits, and makeup powder bases. Just label them, scoop in your product and sealing couldn't be easier. The window is a great touch to show off pretty powdery mixes. COMMENTS: These are absolutely PERFECT for bath salts and fizzy bath salts because they are air tight! I was putting the fizzing salts in the cello bags and they were getting hard and clumpy, these are perfect! And a great size, too. Love them! "A MUST for bath salts!" COMMENTS: These look wonderful for bath salts! The window is great! Nice and professional looking, Holds product well. COMMENTS: Love these bags for bath salts. There is the perfect sized window to see the product. It looks very professional once I put my label on it. Will definitely buy more. COMMENTS: These make for very nice gift bags!!!!!!! COMMENTS: I love this bag. It makes my bath salt look so great. I hope you always carry this product. COMMENTS: I love these nice little bags to put salts in for my clients. They are extremely convenient and easy to use. "Nice appearence to the product"
COMMENTS: I`ve used these for quite sometime and Love them. I use to put my salts in plastic baggies, then insert into organza bags, they looked very nice but the salts ate through the plastic bag. Now no worries and they look so much more professional. A very nice product. COMMENTS: Super Cute and great alternative to heavy jars! The ideas are rolling through my head! I need to order more with a quickness! Thanks for having such large varieties of items to choose from! COMMENTS: I love these bags! They are leakproof and simple to use and seal. I use them for my larger Milk bath and Bath Salt orders. They can hold about 12 oz of product. Since most of my items are naturally colored, the window gives my customers a sneak peak at what's inside. "love this for laundry suds"
COMMENTS: love this for powdered laundry soap- love the window so customers can see the product, and the size is perfect. COMMENTS: We love using these pouches. The window with the gold trim is simply elegant. Wish they came in larger sizes. COMMENTS: I use these for my bath salts, great value, very professional. Easy to set on my store shelves. COMMENTS: I use these pouches for bath salts. I can fit exactly 1 pound of bath salt in them. They were easy to fill and look great. The window allows you to see what the salts look like. COMMENTS: These bags are the cutest things. They will hold 6 of my wax tarts and more of smaller tarts I make. Great gift idea. Add color by punching holes in the top and add homespun tie. COMMENTS: These hold exactly 1 pound of my bath salts. Very professional looking finished product. I slealed it just above the tear notch with an impulse sealer. Works great. I'm getting more colors. Thanks. COMMENTS: I use these for bath salts. (They hold around 1 pound) To dress them up, I hole punch two holes ABOVE the zip closure, about 1 inch apart and string a ribbon through and tye a really cute bow. They look very professional and work well in baskets as well. "Can i use these to package food? (Tea)"
Staff Answer The plastic is food grade but we are not a registered facility for handling FDA items. "Hello, how do these bags hold up with essential oils? I am thinking to make bath fizzy which contain essential oil. The description of the bag doesn't say anything about essential oil. Thank You!" "Would I be able to use these bags for salt and sugar scrubs that contain oil? " Staff Answer These Zip Pouches are most commonly used with Bath Salts as well as various other bath products. You can use these with bath products that contain oil. Yes, this pouch is made of a durable plastic. Just make sure you seal the top well, you should have no problem. "These are not listed as a heat seal bag, but they appear to look like ones that are sealed &have to be torn open for the first use of the product inside. Are these heat seal?" Staff Answer Yes, the tops of these bags can be heat sealed. "Will these hold as much as the 16oz clear bags you sell? I know it says that these hold 12oz-16oz but I ask because I prefer the white bags but I need it to fill as much as possible so if these don't hold as much or you think the clear ones can hold more then I will buy those. Thank you." Staff Answer The Zip Pouch: 16 oz. Clear Side & Silver Side is slightly larger. If you are looking for a bag to hold more product I would recommend the 16 oz. size. "How many cups will these hold?" Staff Answer Between one and a half cups to two cups.